We originally put RKDA on our radars toward the end of January, but in the ensuing weeks, the stock mainly traded sideways. This week, both Tuesday morning and yesterday, we included it on our watchlist once again as we noticed it was finally building up some momentum. Yesterday that momentum turned into an absolute explosion as RKDA blasted off to an astounding new high. Just since Tuesday morning it has traded from a low of 11.17 to a new high of 54.9895 yesterday. That’s a two day swing of 370% and a mind numbing increase of 1244% over the 4.09 low we observed subsequent to our initial mention! On Monday morning, we tagged the VRX Weekly $15 & $15.50 Calls, and after finding success with those as VRX continued to move, yesterday we expanded our target range to include the $16 and $16.50′s as well. After another bullish session, all of those ideas produced opportunities for big gains. The $16 Calls ran from .35-1.24, for a single sessions rip of 254% and the $16.50′s traded in a range from .13 to .75, a 477% upswing. Even though much of our focus over the past couple of years has turned to short term options trading, penny stocks have always been our bread and butter, and RXMD is an example of one that we’ve found incredible success with of late. As we’ve mentioned several times now, we had the chance to get into RXMD as low as .0663 following our initial alert on February 22nd, and from that point, yesterday’s high represented an increase of 221% over a period of eleven trading days. Also in the penny stock arena, we did well with RNVA this week, including it in Tuesday’s premarket report. From a subpenny low of .006, the stock made a 200% move to yesterday’s high of .018, and it’s gone even higher in the premarket this morning. After tagging ZSAN as a bottom-bounce play on Friday, at which time is was trading for as little as 6.8175, we’ve witnessed an explosion this week. This play has also appeared in three out of our last five reports as it has absolutely taken off. Yesterday morning, we pointed out that despite already making significant gains, if it broke an area of key resistance we highlighted on the chart, that things could get interesting and they certainly did. 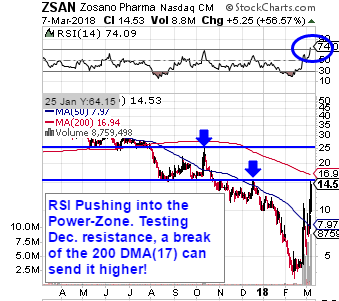 ZSAN exploded from a low of 12.57 and ran as high as 25.70, an intraday move of 104% an a mind-bending 275% over a period of just a few days. That’s fantastic for a stock that started out above six dollars! *Do NOT trade weekly calls on a Friday unless you are an expert level trader! We’ve talked about RXMD every day this week, because the stock has continued to streak to new highs each day. As we’ve mentioned, our February 22nd alert on RXMD enabled our readers to gain entry for as little as .0663. We put ZSAN back on our radars as a bottom-bounce play on Friday, and witnessed a subsequent low of 6.8175. From that point, the stock has made a very nice move in just a short time. Yesterday, following yet another tag in our premarket report, ZSAN ran from 9.58 to 15.74. That worked out to an intraday rise of 64% and a total increase of 131% in a matter of just four trading days. As you can see on the included chart snapshot, if the stock can pass through the highlighted resistance area and breach the 200DMA, things could get very interesting. We formulated a bearish options idea for Dollar Tree yesterday morning, and it worked out in our favor as the stock gapped down hard, followed by more backsliding during the session. Our targets were the DLTR Weekly $95-92 Puts and the two sets of contracts in the lower end of that range yielded notable intraday gain opportunities. We also want to look at Burlington Stores, Inc. BURL on the heels of its earning release and signal a few contracts for observation- the BURL 03/16 $120 & $125 Calls. It was the morning of September 25th that we tagged BYOC for observation and it has essentially undergone a continual uptrend over that time period. That morning we witnessed a low of .0035 in the stock and as of yesterday’s new high reached just prior to the close, was .0189. That amounts to a very impressive boost of 440% over a time span of just 13 trading days. We placed CASI on watch in yesterday morning’s premarket report, and wanted to come back this morning to talk about its performance. The stock ran extremely hard out of the starting gate and attainted its high within the first half hour of trading. We also want to take a final look at the overall move HMNY has made for us. It appears as if its epic run is over but it brought with it one of the biggest, fastest moves we’ve ever seen in a stock in its price range. From our observed low of 5.47 subsequent to our alert on the stock on September 20th, to yesterday’s mind-bending high of 38.86, represents a rise of 610% Congratulations to anyone who was able to take this one for a ride.